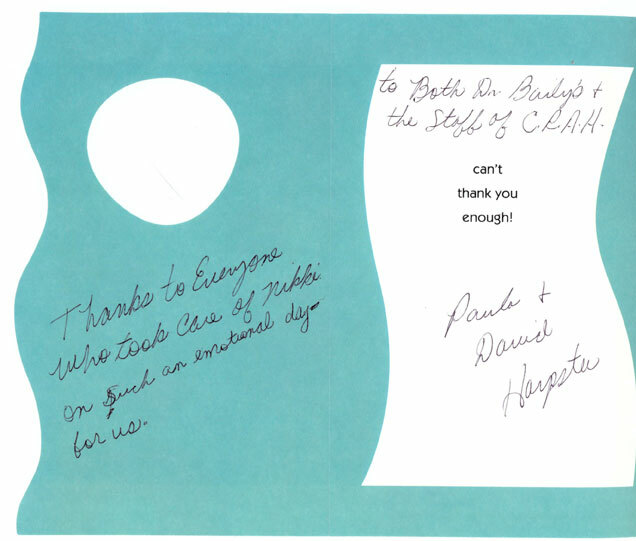 We want to let you know how much we appreciated all you did over the years. 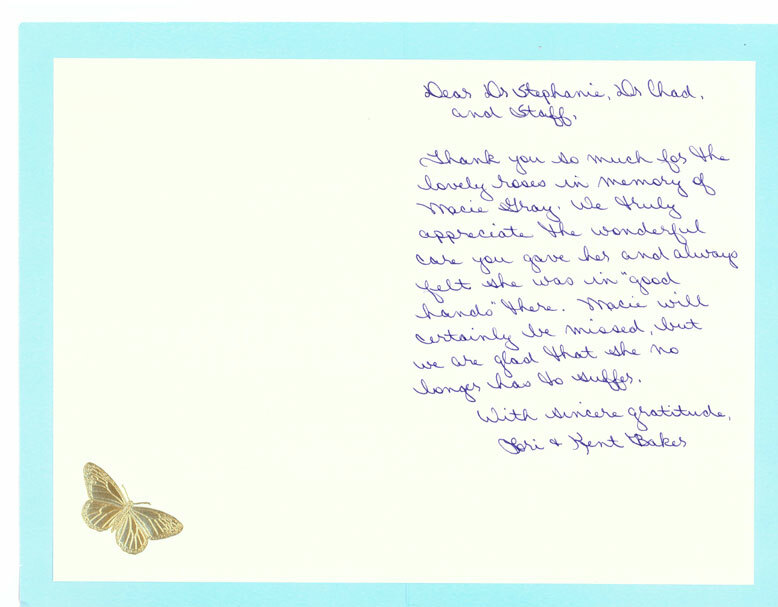 A VERY SPECIAL THANK YOU to you, Dr. Stephanie. You’re kindness is very much appreciated. You are a wonderful doctor with such a warm heart. 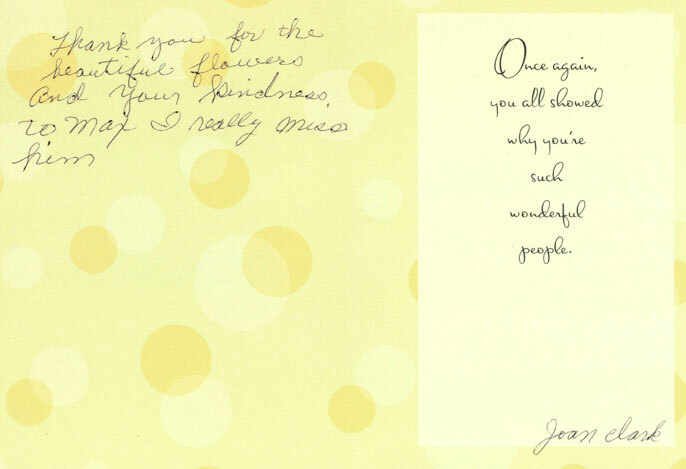 We would like to thank you for the flowers and sympathy card that were sent in rememberance of Lars. 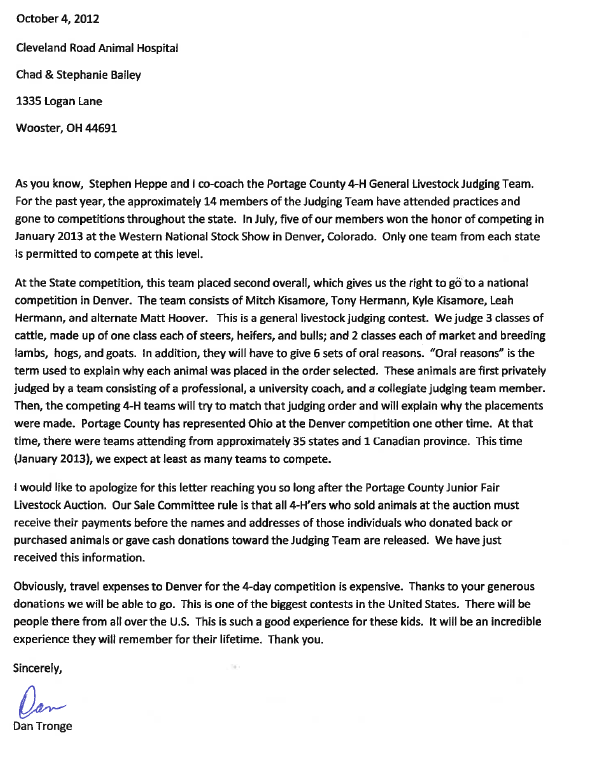 Obviously, travel expenses to Denver for the 4-day competition is expensive. Thanks to your generous donations we will be able to go. 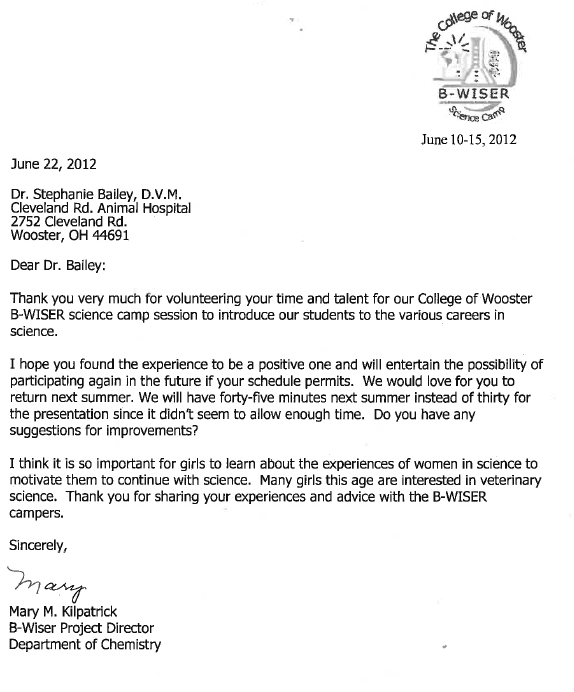 Thank you very much for volunteering your time and talent for our College of Wooster B-WISER science camp session to introduce our students to the various careers in science. 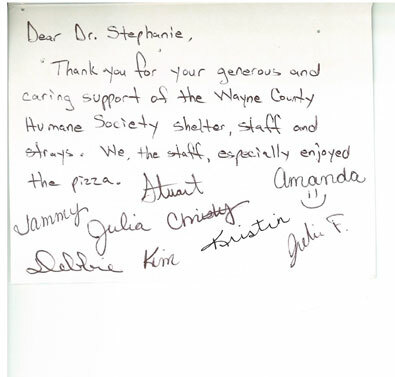 On behalf of the Wayne County Humane Society (WCHS), its board members and staff, thank you for your extreme generosity and your support. 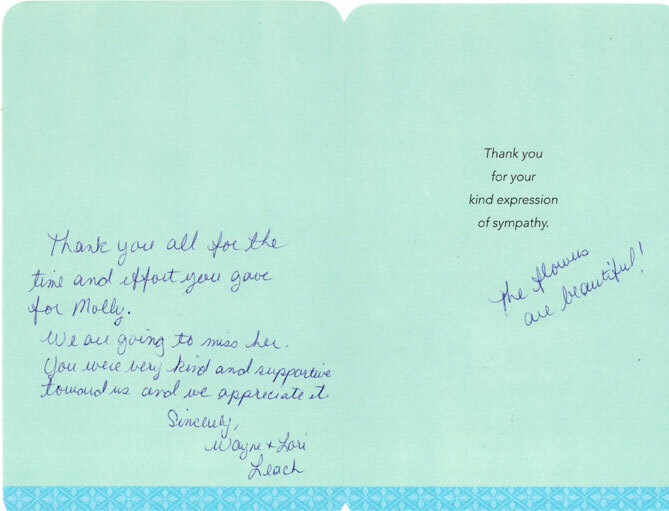 Thank you for the flowers and thoughtful sympathy card. Whitney was a very sweet, special cat and our hearts are overwhelmed with grief over her loss. Thank you very much for over the years that you took the best of care of Buffy! I would like to extend my heartfelt gratitude to you all for all the love, caring and the TLC you have shown my special Sammy (“Sam Sam”). 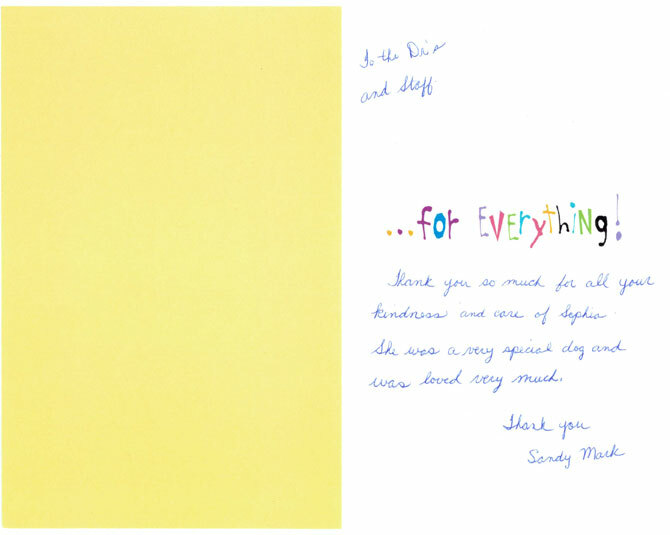 Crystal, Jim and Sue wish to thank you for her excellent care. On behalf of the members and other advisors, thank you so much for coming to speak to our 4-H Club! 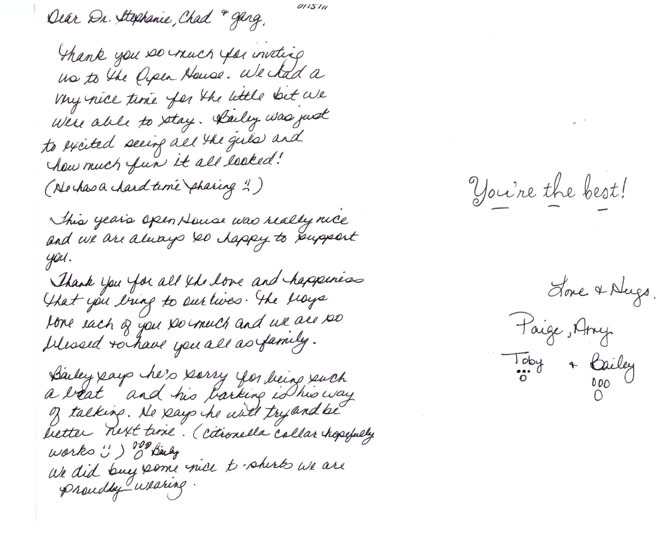 We wish to give you our heartfelt thanks for bringing our beloved Emmaline back from the brink. 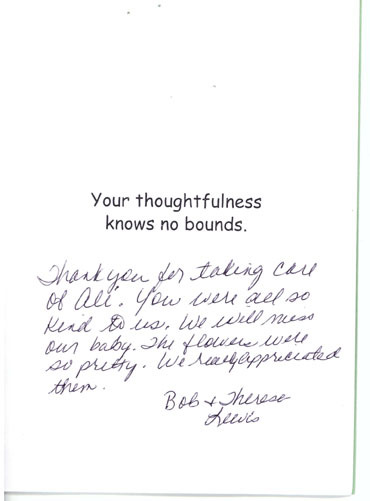 We want to thank you so much for taking great care of Precious. 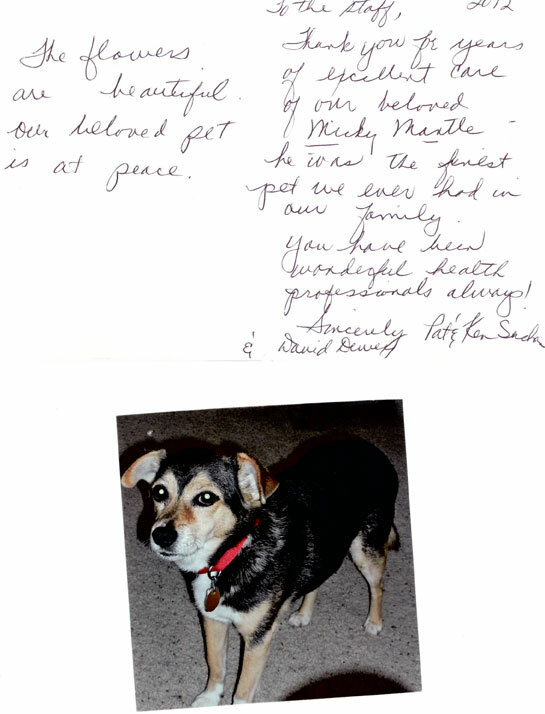 We would like to extend our heartfelt thanks to you for seeing our dog, Lady, when you didn’t have to. Thank you for taking such good care of Angel. We had been nervous about having her teeth cleaned for a long time, but you guys made us feel comfortable enough to do it. Thanks for being my guardian-angels watching over me while I was hurt. Thank you for going above and beyond to help us out with Riley. Thank you for taking care of Koko from her birth until the very end. 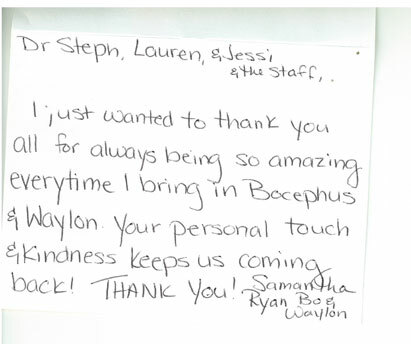 Thank you for taking care of Samantha. Thanks for always calling me back and letting me know what was going on. Thank you for showing so much kindness at the Boiler House the other night! We really appreciate it! Thanks for caring for our Lizzie. She’s doing good for now. She’ll be in soon for her checkup. Today, we said goodbye to our beloved Jake. 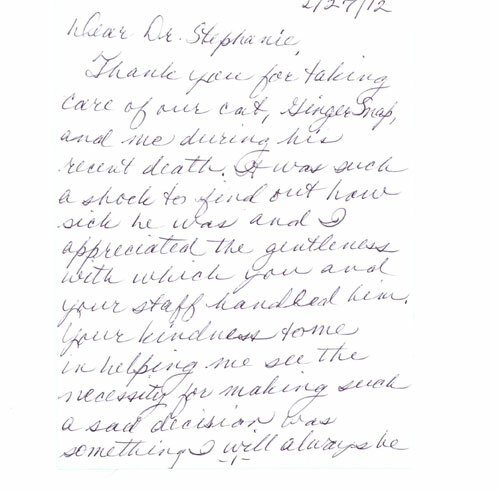 We were assisted by Dr. Stephanie, who postponed her own doctor’s appointment to comfort us, as well a assistants who so lovingly attended Jake as he left this world. 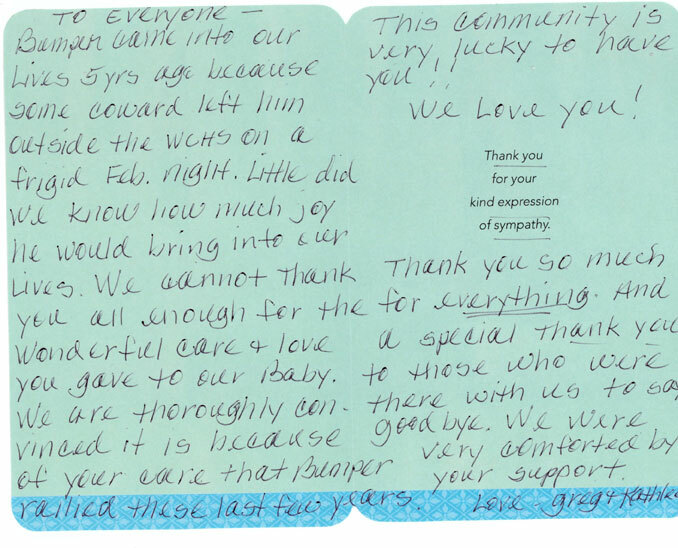 Thank you for the fabulous care you gave Arthur during his final days. Initially, I was worried about Arthur meeting new vets so late in his life. However, it was quickly apparent that he was in the care of two talented young vets. Thank you so much for taking Brandy Merk in without an appointment, believing us when we said she was in pain even though she was stoic in the office. Thank you so much for always taking such great care of the Paunter children. Thank you all very much for sharing and caring for my beloved Spike. 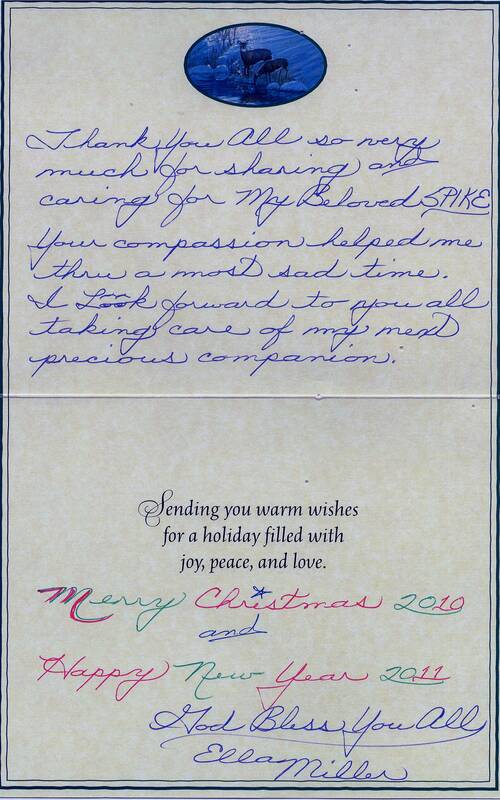 Your compassion helped me thru a most sad time. Hi! It’s me! 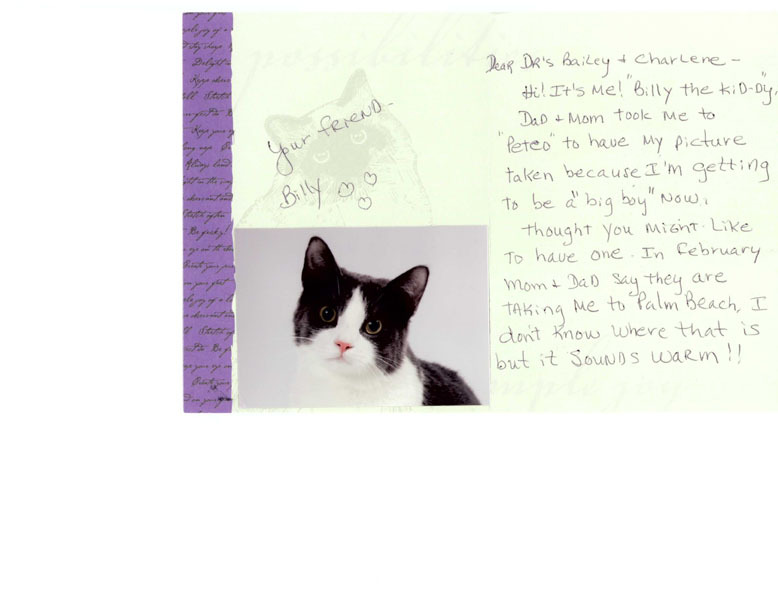 “Billy the Kid-Dy.” Dad & Mom took me to “Petco” to have my picture taken because I’m getting to be a “big boy” now. 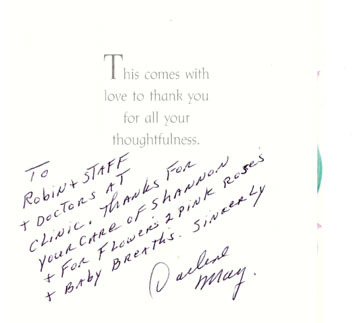 Thanks for your care of Shannon and for flowers (2 pink roses and 2 baby breaths). 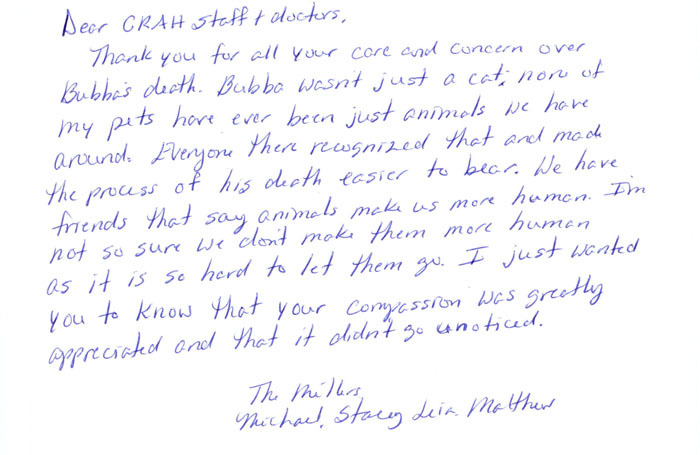 Thank you for all your care and concern over Bubba’s death. Bubba wasn’t just a cat; none of my pets have ever been just animals we have around. Everyone there recognized that and made the process of his death easier to bear. Thank you so much for inviting us to the Open House. We had a very nice time for the little bit we were able to stay. Bailey was just too excited seeing all of the girls and how much fun it all looked. This is just a little thank you for all the advice you gave David on Slider. You really went above & beyond on taking the time to talk to him and answering all of his questions. Thank you for taking care of Ali. You were all so kind to us. We will miss our baby. The flowers were so pretty. We really appreciated them. 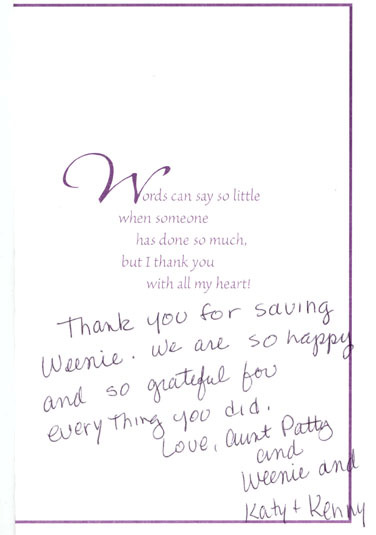 Thank you for saving Weenie. We are so happy and so grateful for everything you did. 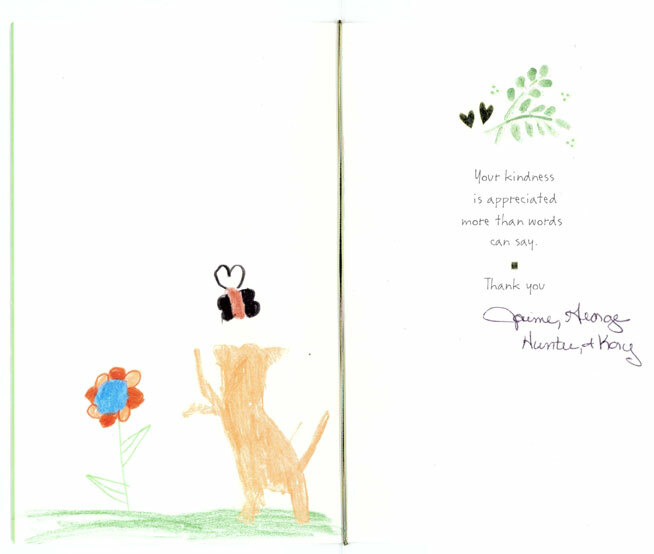 Thank you for taking care of our cat, GingerSnap, and me during his recent death. Thank you for the beautiful flowers and your kindness to Max. I really miss him. 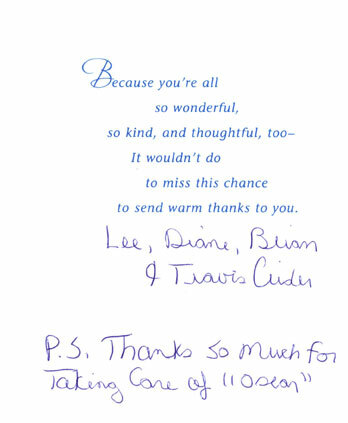 Because you’re all so wonderful, so kind, and thoughtful too — it wouldn’t to miss this chance to send warm thanks to you. We cannot thank you all enough for the wonderful care and love you gave to our baby. 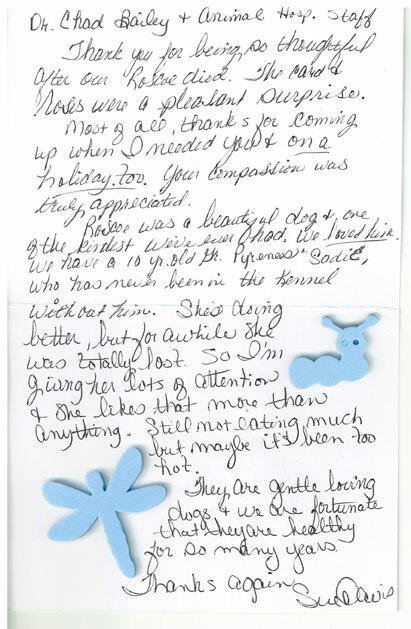 We are thoroughly convinced that it is because of your care that Bumper rallied these last few years. Your kindness is appreciated more than words can say. Thank you. 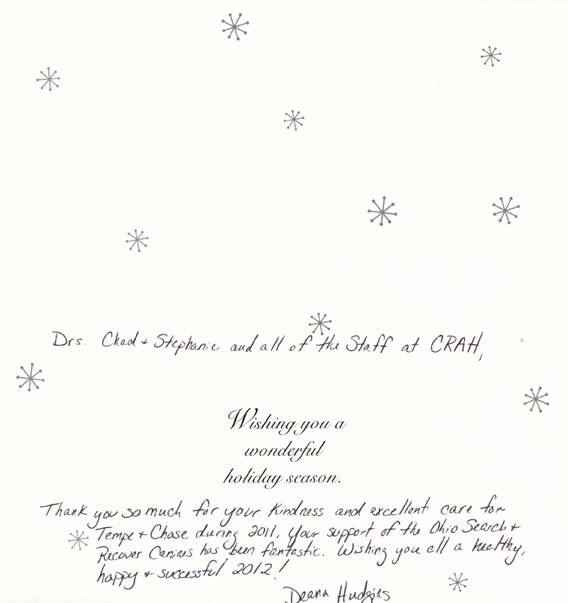 I want to thank everyone for their kindness, and especially Dr. Chad and the young lady who assisted him. 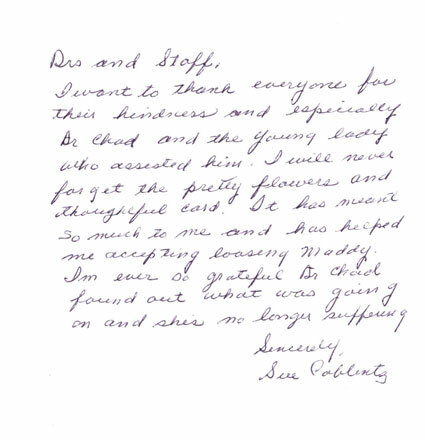 I will never forget the pretty flowers and thoughtful card. Thank you for years of excellent care of our beloved Mickey Mantle — he was the finest pet we ever had in our family. 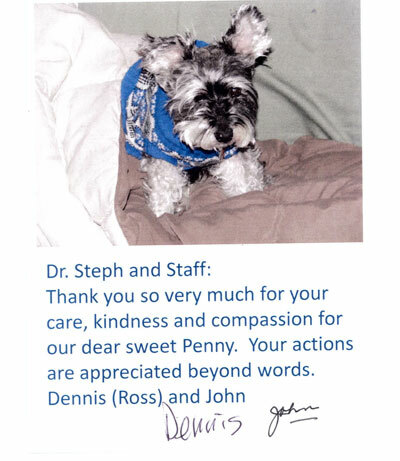 Thank you very much for your care, kindness and compassion for our dear sweet Penny. Your actions are appreciated beyond words. Thank you so much for the lovely roses in memory of Macie Gray. 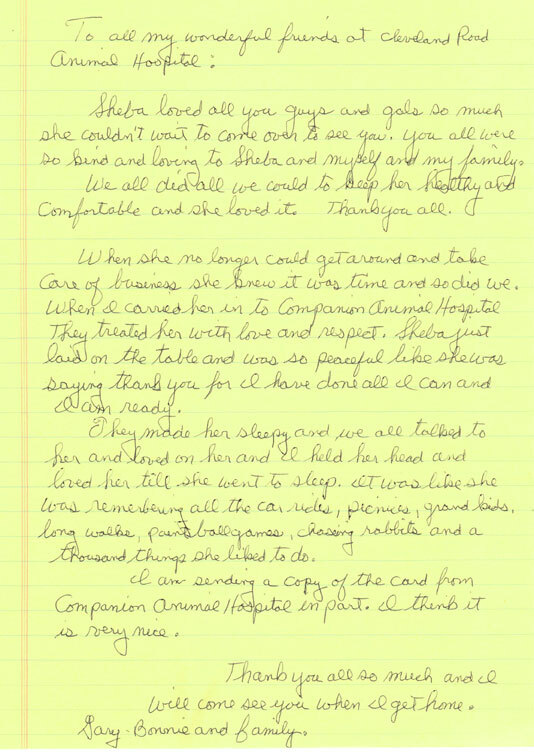 We truly appreciate the wonderful care you gave her and always felt she was in “good hands” there. 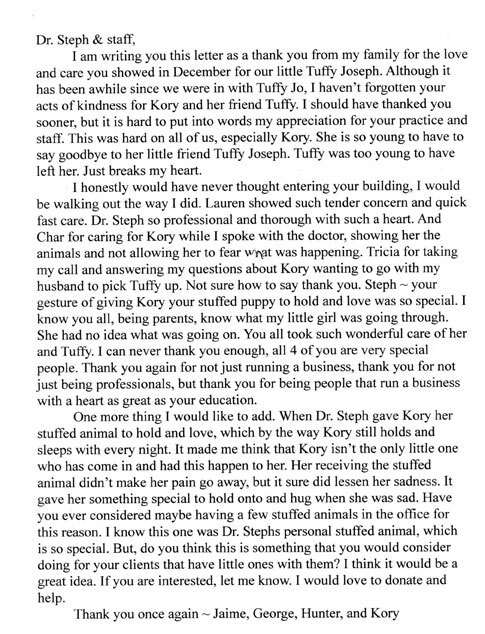 I am writing you this letter as a thank you from my family for the love and care you showed in December for our little Tuffy Joseph. Sheba loved all you guys and gals so much she couldn’t wait to come over to see you. You all were so kind and loving to Sheba and myself and my family. Thanks to everyone who took care of Nikki on such an emotional day for us. Thank you for all the time and effort you gave Molly. We are going to miss her. 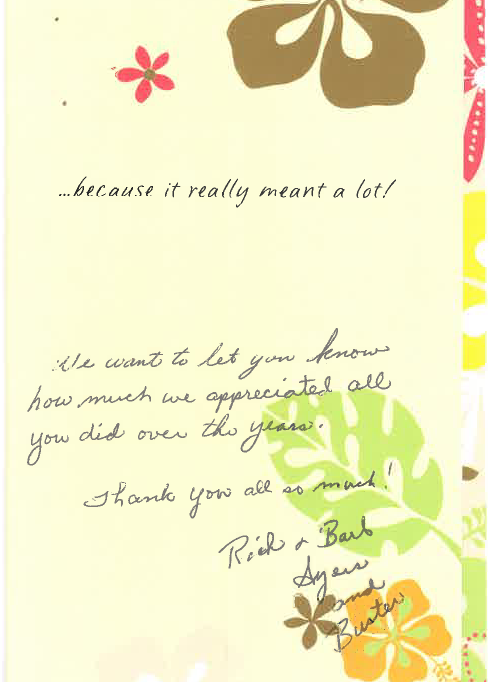 You were very kind and supportive toward us and we appreciate it. 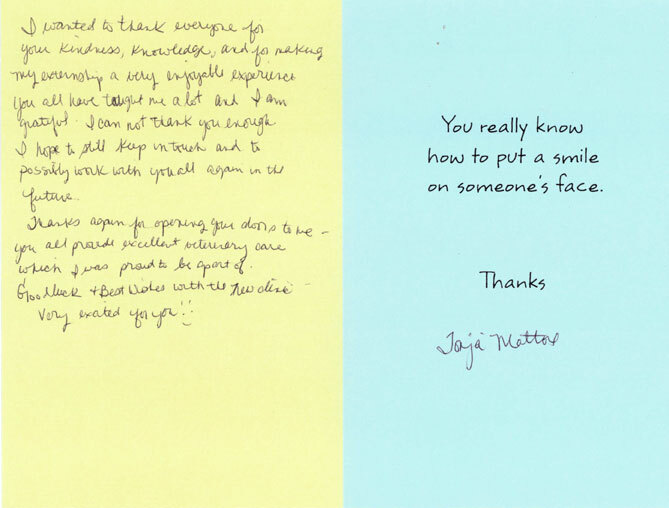 I wanted to thank everyone for your kindness, knowledge and for making my externship a very enjoyable experience. You all have taught me a lot and I am grateful. 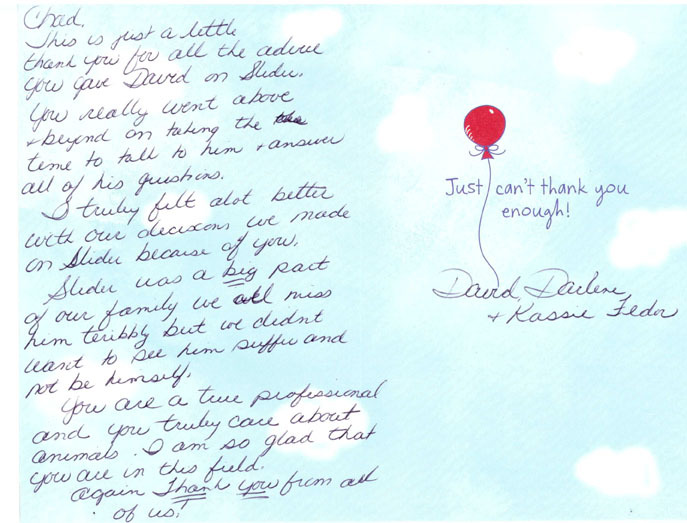 Thank you for taking such great care of us during our difficult time. Thank you for showing such great compassion towards Jake and us as we said our final goodbyes to our best friend and companion. 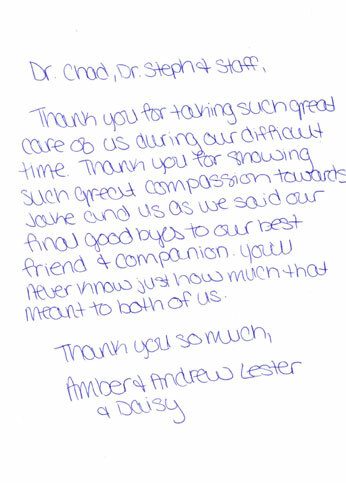 Thank you so much for your kindness and excellent care for Tempe & Chase during 2011. 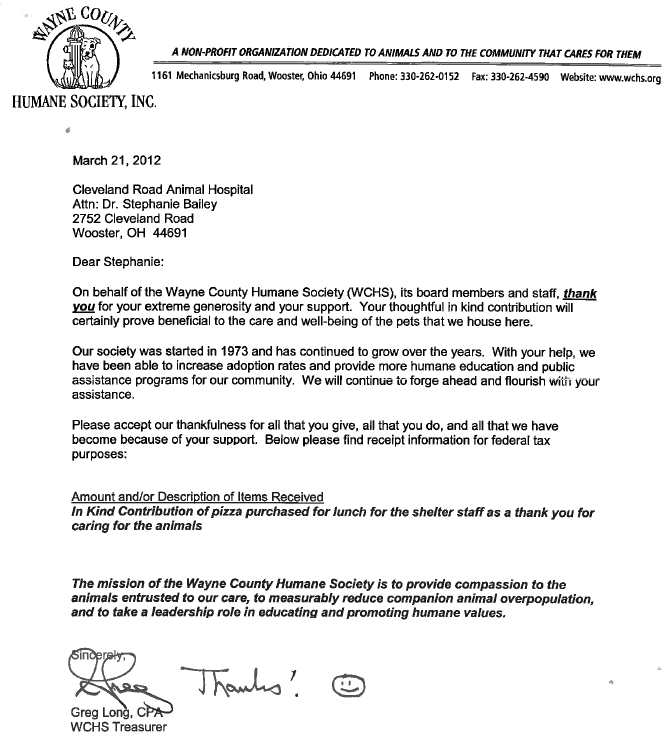 Your support of the Ohio Search & Rescue Canines has been fantastic. Thank you so much for all your kindness care of Sophia. She was a very special dog and was loved very much. 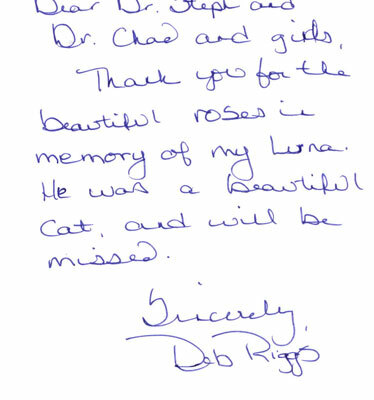 Thank you for the beautiful roses in memory of my Luna. He was a beautiful cat and will be missed. I just wanted to thank you all for always being so amazing everytime I bring in Bocephus & Waylon. Thank you for being so thoughtful after our Roscoe died. The card and roses were a pleasant surprise.